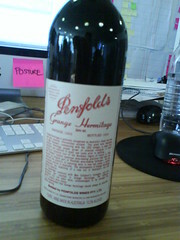 You are currently browsing the tag archive for the ‘Penfolds Grange’ tag. I’m not a wine connoisseur, but I’ve heard of Penfold’s Grange. People in wine circles talk about it in reverent tones and to have a bottle of Grange in your collection is a badge of honour. It’s so prized that in 2004 a bottle of the original vintage (1951) sold for just over $50,000. That’s insane! It’s rare, it’s world renowned, it ages well and it’s expensive. We can be that too!